BitRiseTrade is managed by a team of traders from various backgrounds,: private equity, financial derivatives, forex market. We came to the world of cryptocurrencies trading in recent years and have proved ourselves as Independant traders. We have now decided to work in a team and start up a business That can make it possible for Most people to make a profit with us. The company is Also made up of web engineers and Multilingual support staff. Our objective is to provide a high quality service to our members including stable earnings, fast payments and Reliable helpdesk. 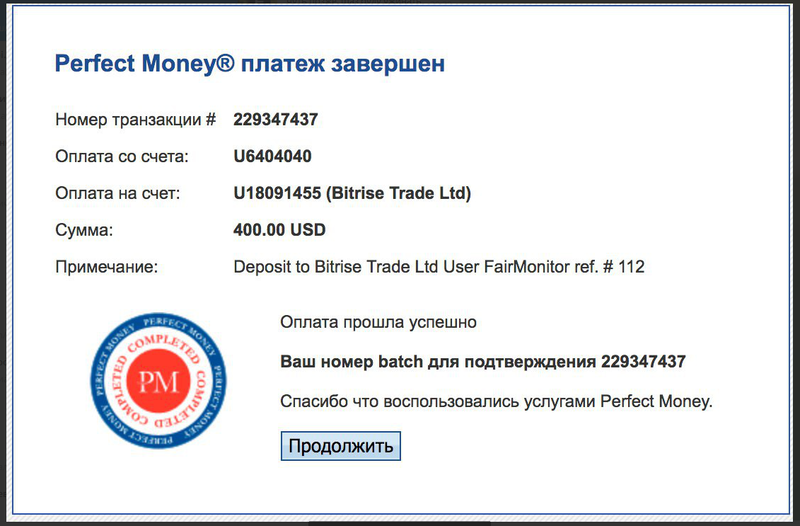 Bitrise Trade	+42.9 Received Payment 42.9 USD from account U18091455. Memo: API Payment. Withdraw to FairMonitor from Bitrise Trade Ltd - Your way to wealth!. The amount of 13.2 USD has been deposited to your account. Memo: API Payment. Withdraw to naale from Bitrise Trade Ltd - Your way to wealth!.. Bitrise Trade	+72.6 Received Payment 72.6 USD from account U18091455. Memo: API Payment. Withdraw to FairMonitor from Bitrise Trade Ltd - Your way to wealth! 09.25.18 15:54 Received Payment 0.9 USD from account U18091455. Batch: 229610006. Memo: API Payment. Withdraw to TimEight from Bitrise Trade Ltd - Your way to wealth!. The amount of 44.18 USD has been deposited to your account. Memo: API Payment. Withdraw to naale from Bitrise Trade Ltd - Your way to wealth!.. Date: 15:49 25.09.18. The amount of 2 USD has been deposited to your account. Accounts: U18091455->U2631114. Memo: API Payment. Withdraw to myinvestbloger from Bitrise Trade Ltd - Your way to wealth!.. Date: 18:08 25.09.18. Batch: 229626393. The amount of 1.2 USD has been deposited to your account. Accounts: U18091455->U4222871. Memo: API Payment. Withdraw to nelomota from Bitrise Trade Ltd - Your way to wealth!.. Date: 17:22 26.09.18. Batch: 229738893. The amount of 0.3 USD has been deposited to your account. Accounts: U18091455->U2631114. Memo: API Payment. Withdraw to myinvestbloger from Bitrise Trade Ltd - Your way to wealth!.. Date: 16:43 26.09.18. Batch: 229734892.